Herbalists have an eye for beauty and worth, seeing usefulness inside what others consider useless. Often reviled plants like nettles, dandelions, burdock, plantain, chickweed, lambs quarters, and red clover often grow nearby in favorite fields or woodland paths, or even on our lawns, and make delicious and nutritious teas as well as herbal vinegars, soups, and salads. Even if you’re not able to conscientiously gather weeds (you should be 100% certain the plant is what you think it is; harvest 50 feet back from the edge of the road, never near telephone lines; never take more than 7-10% of the plants), many weedy plants can be found at your local herb store or co-op. 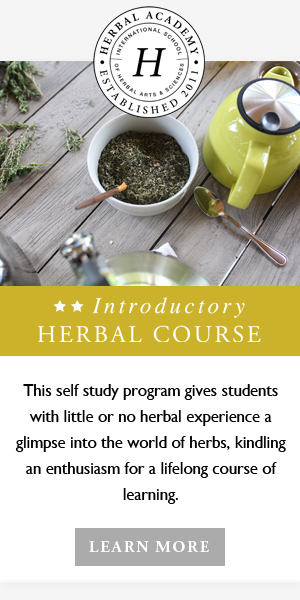 Here at the Herbal Academy, one of our favorite teas is Nourishing Weedy Tea, containing nettle leaf, dandelion leaf, and red clover blossom. We’ve also added peppermint for extra minerals and to balance the flavor. Nettle – high in minerals, vitamins, natural anti-histamines, anti-inflammatory. Red clover blossom – contains isoflavones, sweet taste and fragrance, beautiful. Pregnant or nursing women, and people on blood thinners should avoid red clover. We like to make a quart and drink one cup at a time throughout the day. This recipe uses dried herb proportions. Steep for 20 minutes to four hours, strain, and enjoy drinking your weeds!